...and you get one Pencil Pot! I've actually been (hoarding) using this container for my pencils for months, with the intention of doing something with it. It's one of those projects that I think about all the time, rather than doing. But Denise's fabby new Challenge at Cupcake has given me the boot up the bum I needed! (Thanks Hun!) She would like to see you Alter It! Well you can imagine what happened to my stomach when I read that! But several coats of acrylic paint later, some sanding, sticking and scrunching and I'm happy. In fact, I might even do the other container too... And I told you you'd be seeing more of this fabby Cotton Velvet Lace from Sew Sweet, didn't I? Awwwwwwwwwww Faye....this is really beautiful....love your cat in the sidebar looking at the fishes! I want to do one right now...and I have a least two of these gravey tubs in the recycling! This is so shabby chic and fabulous!!! I so want one now!! Lovin' all those buttons and the gorgeous flower. Just too cute! I bet this looks so cute in your little craft cave! Those buttons are the perfect touch and that ribbon is gorgeous and now you can look at it everyday. 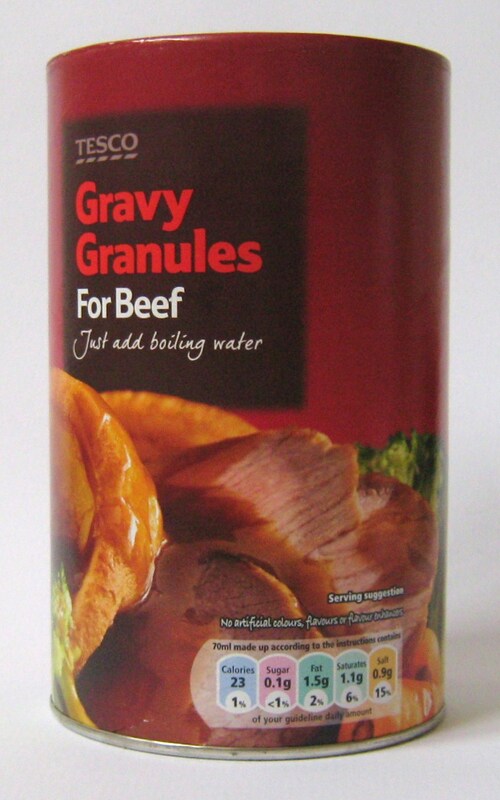 Who woulda thunk a gravy container could be so pretty? 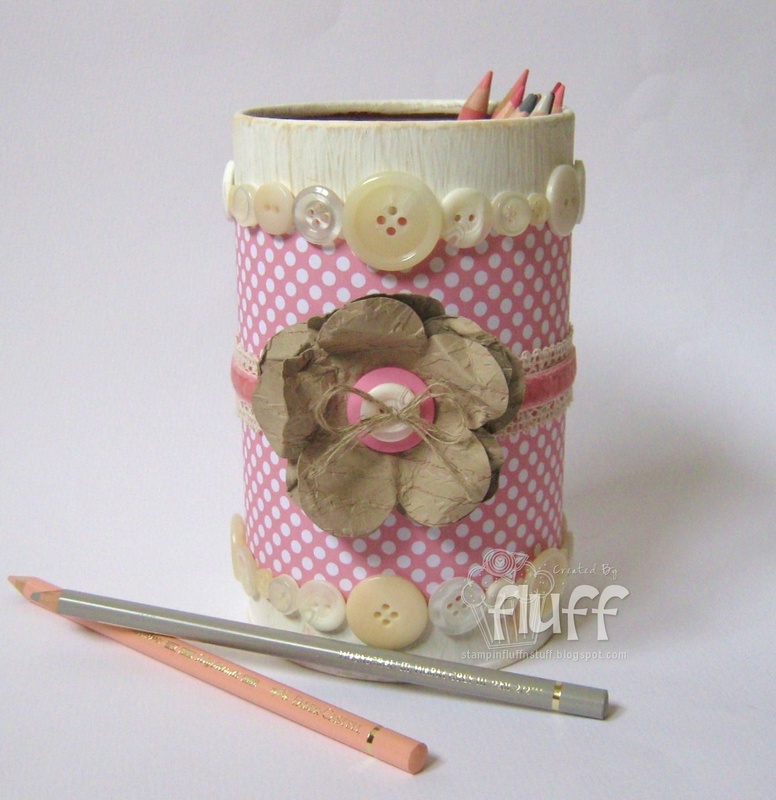 Wow Faye, this is a gorgeous pencil pot. I love the vintage look it has. Faye, I'd never have guessed that was a gravy granule pot if you'd not said so it looks fabulous. I love all the buttons and the colours are so pretty. So beautiful! Love all the yummy buttons and that pretty flower! This is perfect for pencils! This is brilliant Faye, love the cute button rows and the fabby ribbon..and the colours too!!! A splendid make over! Woooooow hon, this is STUNNING! I love the pink and cream and the buttons are gorgeous - fabby idea, LOVE IT!! Bags I the other wun. Muver. ooooooooh! what a stunning pot! Beautiful - a great recycling job! Lovely work Fluff, gorgeous colours and button borders, so useful too. A gorgeous creation, love all the buttons and beautiful flower! Thanks for joining us at Truly Scrumptious.